I do not believe in writer’s block. It, a close cousin to fear, is something we authors create. The words stop when we put too much pressure on ourselves to write, when we try to force the story instead of letting it flow, when we must have everything just so or it will be terrible! 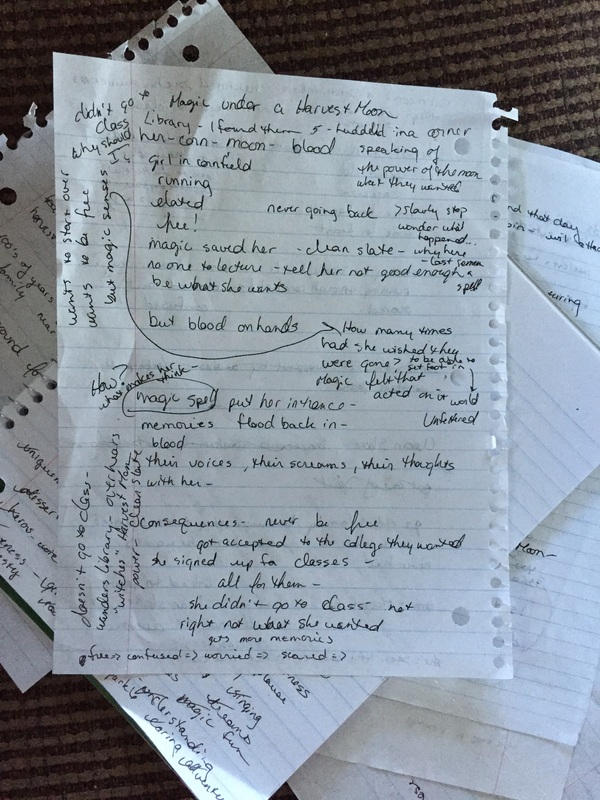 In my last post, I wrote about how I had to write a story, but was having a bit of trouble. I had a few images in my mind, but nothing that fit together. I was trying to force a bajillion ideas into being a story. I thought about it all the time. I wanted to scream. Now, stepping away, going for a walk, reading a book, doing anything BUT working on this story would have been a truly great idea except… I have a deadline! AND PANIC WAS SETTING IN! The absolute worst thing for writing. So what to do? I took all the pages of notes (seriously I think there were five) and threw them away. With them went the rut that had ensnared my mind, all the ideas that lead back to the mess on those pieces of paper, the notes that weren’t helping. AND BRAINSTORM! I love to get a notebook and my favorite pen and write all the things. I love the way this bit of dialogue and that strange image can suddenly link together. I love when all the blank spaces fill with fabulous with scenes and description that link all my initial thoughts together. I circle. I scribble. I draw arrows. I write sideways in the margins. And somehow it all makes sense. I went back to the beginning. The story had to fit with a certain theme, out of my control. From that theme I latched onto the few images in my mind. I wrote them down… then stared at them. This usually works! Why isn’t this working! And the fabulous Michelle Hoehn (@mah_hoehn go follow her, she’s fabulous!) tweeted back asking if maybe I needed a brainstorm buddy. Writers should help each other and help is always good! So YES! I said. YES! Let the DMing begin. It is a miracle how explaining your idea to someone else, someone not locked in your brain, can shine a light on what the real story is. How a few questions you hadn’t thought to ask yourself set the ideas spinning. And BEHOLD! I have a solid idea. One I don’t hate. One without glaring evidence of me forcing the plot. What I learned? That I was overthinking. (I know… shocker!) The pressure to make this story fabulous had me throwing too many ideas in the pot, when simple is better. So, I have 1600 words of a story, I will finish the first draft today, then revise and send to CPs tomorrow. Maybe, this one will be pretty good. I have hope for it… if I can get everything woven together just right. All writers everywhere… REMEMBER… YOU ARE NOT ALONE! So many of us are ready to help. Just reach out. Reaching out, an idea to be applied to life. Problems? ASK OUT FOR HELP! Something not going right? TALK ABOUT IT! We’re all in this thing called life together. And the world could use a bit more together, a bit more caring, a bit more understanding. And the world definitely needs more stories. in other ways to say this..even in writing…ASK for HELP!!!! learning NEVER ends does it Kathy?? Good for you for reaching out. As another commenter said, my husband is often who I go to for brainstorming. But also my teen sons, too. They’re both insightful, and it’s amazing what bouncing ideas off them has led to.